ICICI Lombard GIC Ltd. is one of the leading general insurance providers in India. The firm commenced its operations in 2001 and have, as on 31 March 2017, issued above 17 million insurance policies and settled over 2 million claims. Depending on the kind of liabilities incurred and your convenience at the time of the mishap, you can go for either a cashless or a reimbursement claim. Inform the insurer as soon as the mishap happens and register your claim request. You can call the ICICI Lombard customer care toll-free number on 1800-2666 to register your claim request. The customer care executive will guide you through the claim procedure and offer you further assistance if and when required. You will be given a claim reference number for all your future references. Keep a note of the number of the vehicles involved in the mishap, if any. Take down the names and contact details of the witnesses, if any. The customer care executive will give you the list of documents to be submitted by you in order to process your claim along with the list of ICICI Lombard authorised garages. File an FIR at the nearest police station in case of third-party liabilities or own damage liabilities. Drive or get your vehicle towed to the nearest cashless garage. The Customer Service Manager (CSM) from ICICI Lombard will get in touch with you within 24 hours of claim registration. Submit the originals and copies of all the documents as instructed by the customer care executive to the CSM and get the copies verified against the originals. The CSM will get the repair estimate of your car and approve your car for repair. The part of the insured amount that the insurer has agreed to pay will be paid directly to the garage. You will have to pay the balance amount that comprises of the deductibles, depreciation, etc. as instructed by the CSM. The customer care executive will give you the list of documents to be submitted by you in order to process your claim. ICICI Lombard will approve the repair of your vehicle post document verification. Drive or get your vehicle towed to the nearest garage to get it repaired. Post your vehicle has been repaired, settle the bills for repairs directly to the garage. Collect the payment receipt and invoice from the garage. Submit the payment receipt and invoice to the insurer, who, after verifying the submitted documents will reimburse the insured amount to you. What is a Roadside Assistance (RSA)? Roadside Assistance is a service offered by the ICICI where you will be provided with the necessary assistance in case you are left stranded on the road due to a mechanical/electrical breakdown of your vehicle, flat tyre, etc. How many times can I request for the Roadside Assistance service during the tenure of my insurance policy? You can avail the RSA service up to a maximum of 4 times during the tenure of your insurance policy. What is a policy endorsement in car insurance? A policy endorsement is any change/update made to your original insurance policy as requested by you and agreed by the insurer. 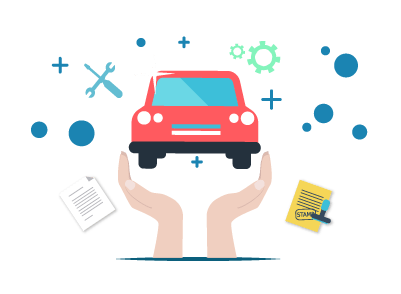 What is the policy tenure of a car insurance? The car insurance is valid for a period of 12 months starting from the date of policy issuance. What are the different car insurance policies available? There are two kinds of car insurance policies available; comprehensive car insurance and third-party liability cover.